Cabin Creekwood’s cabins in Virginia are convenient to Wintergreen Ski Resort. Book your trips early for this upcoming Wintergreen ski season and save! If you know the dates that you’d like to book a ski vacation, you can go ahead and book your cabin getaway with us. Booking early ensures that you will get our best cabins. Opening dates are a great time to come up because rates are the lowest that they will be all season. Peak periods for visitors coming up for Wintergreen skiing trips are Thanksgiving weekend, the Christmas holiday period / Hanukkah and New Year’s Eve, Martin Luther King Jr weekend, and Valentine’s Day. 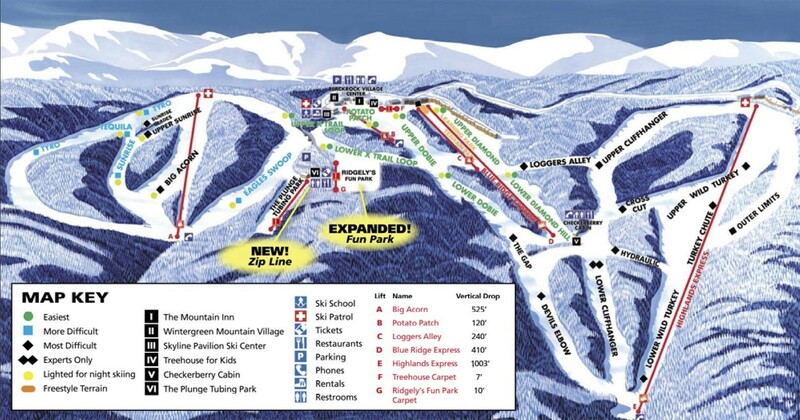 Wintergreen Ski Resort opened in 1975 and today features 24 ski-able slopes and trails. There are 8 lifts to efficiently move the traffic of skiers and snowboarders. Roughly 20% of the trails and terrain is considered primarily for beginners, the remaining 80% of terrain is split 40 / 40 between intermediate and advanced slopes. There is also a great terrain park for trick skiers and snowboarders and it is re-shaped frequently to provide some change for those that visit the park throughout the season.